What is the fine tune function? 2. The main menu appears on the screen. Press the ▲ or ▼ button to select the Channel mode. 3. Then press the ENTER button to access the Channel menu. 4. Press the ▲ or ▼ button to select the Fine Tune, then press the ENTER button. 5. Press the ◄ or ► button to adjust the fine tuning. To store the fine tuning setting in the TV’s memory, press the ENTER button. 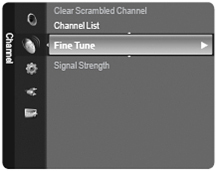 • If you do not store the fine tuned channel in memory, adjustments are not saved. 6. To reset the fine tuning setting, press the ▼ button to select “Reset”, then press the ENTER button. Press the EXIT button to exit. • "*” will appear next to the name of fine-tuned channels.